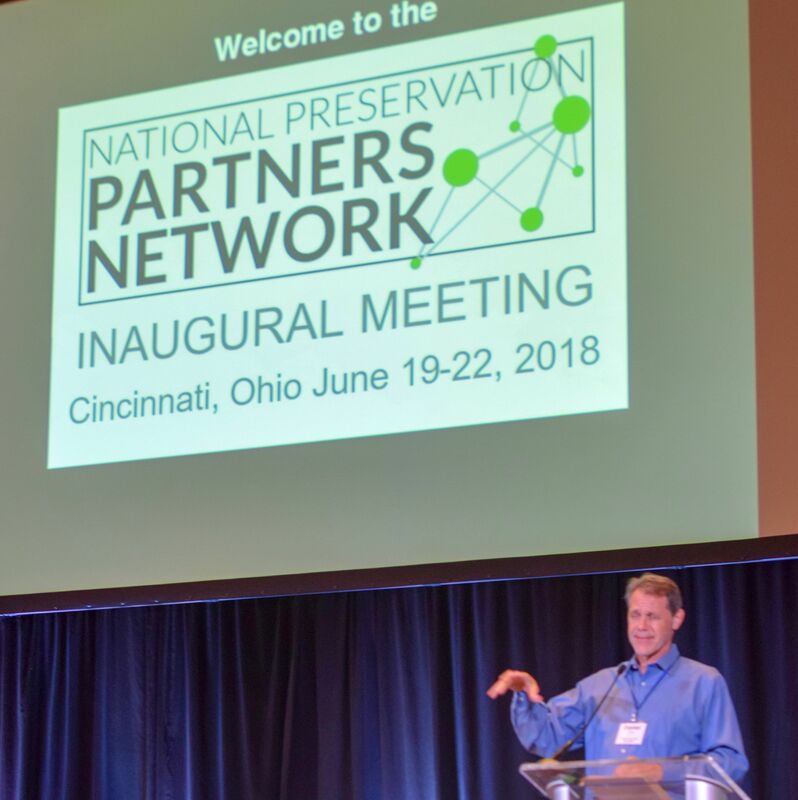 On June 19–22, 2018, the National Preservation Partners Network gathered in Cincinnati for its inaugural meeting as an independent and self-sustaining organization. The National Preservation Partners Network’s mission is to advance the growth and effectiveness of the preservation movement through communication, education, training, and a common advocacy agenda. Nearly 50 representatives from more than 24 states and territories attended this initial meeting. The National Trust for Historic Preservation has worked with and supported state and local preservation organizations for more than 40 years—first through the Member Organization Program, lovingly referred to as MOP, and later through the National Trust Partners Program, which was inspired by recommendations from the Nancy Campbell Task Force. The recommendations spurred National Trust president Richard Moe’s vision of a professionally staffed, statewide preservation organization in each of the 50 states. After 18 years of work, the National Trust Partners Program nearly achieved that vision. That long trajectory is what led to the launch of the National Preservation Partners Network—an independent organization focused on the health and success of the preservation movement. Over the past several years, facilitated discussions among the Partners, the Trust, funders, and stakeholders spurred the realization that the preservation community would be better served by the Partners Network operating as an independent organization. A steering committee of a dozen preservation leaders from across the country held regular teleconferences for nearly two years, revealing a new structure at the Partners Network meeting in Seattle in spring 2017. This summer the Cincinnati Preservation Association and Heritage Ohio organized three days of outstanding programming in a city that is rediscovering itself through preservation. Some early bird attendees arrived Tuesday evening to enjoy a tour of the National Historic Landmark community just down the Ohio River in Madison, Indiana. Official Partners Network business began the following morning at the host hotel, the Hilton Netherland Plaza. Attendees elected a board of directors: Samantha Bosshart of the Saratoga Springs Preservation Foundation, Jessie Fisher of Preservation Buffalo-Niagara, Doug Gasek of the Preservation Alliance of Minnesota, Kirk Huffaker of Preservation Utah, Fairleigh Jackson of Preserve Louisiana, Kji Kelly of Historic Seattle, Annie Levinsky of Historic Denver, Bruce MacDougal of Preservation Action, Heather McClenahan of the Los Alamos Historical Society, Bonnie McDonald of Landmarks Illinois, and Barbara Pahl of the National Trust. As in years past, attendees also heard from representatives of the National Trust and Preservation Action. Leaders from Cincinnati and other Ohio cities made polished presentations about a variety of preservation issues and described success stories that any community would be proud of. Topics ranging from contending with a large-scale state utility and the placement of exterior gas meters in historic districts to the role of African Americans in the revitalization of Mount Auburn and Over-The-Rhine—along with a cook’s tour of Skidmore, Owings & Merrill, a Midcentury Modern hotel—grabbed everyone’s attention. Wednesday evening, the group enjoyed dinner on the grounds of Pinecroft, the estate of Powel Crosley Jr. 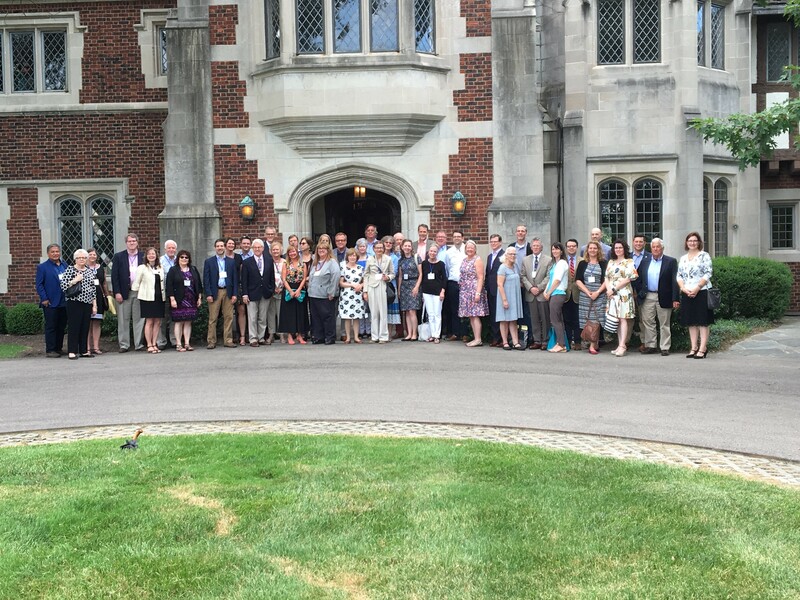 The evening, which was made possible by generous support from the Marvin Window and Door Company, included a tour of the gardens and of the 1928 Tudor Revival estate as well as comments about the restoration of the King Records building from Timothy Riordan. Thursday featured small group breakout meetings of statewide, big city, and local preservation organizations as well as a tour of both the recently restored 1878 Music Hall and the Union Terminal, an Art Deco masterpiece that is in the final stages of a complete rehabilitation. 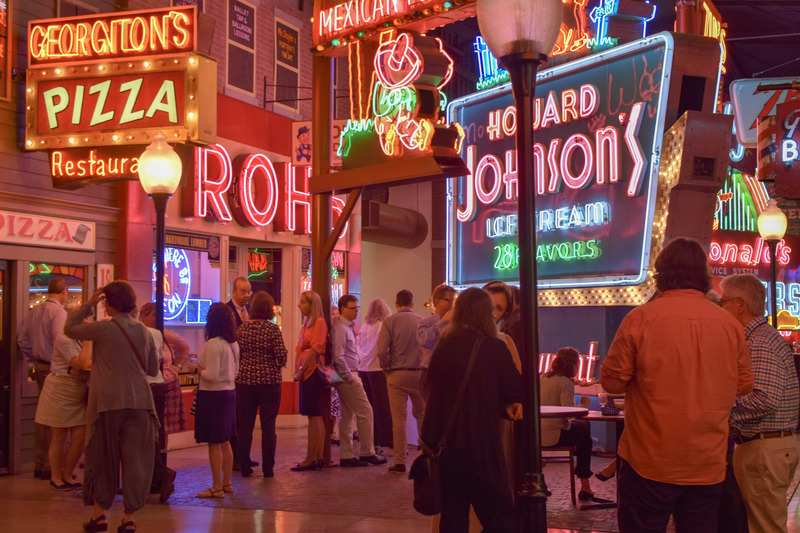 The day culminated with a visit to the American Sign Museum and a reception hosted by Sixty West. Friday morning began with a group forum at the Mercantile Library in downtown Cincinnati followed by the final partners’ working session, sponsored by GBX Group. Preservation organizations—including those with preservation as a core value and those engaged in building a constituency for preservation—and advocates are encouraged to apply to join the new Partners Network. Help us grow our movement nationally and strengthen our organizations and communities at the local and state levels. Members benefit from sharing knowledge and best practices, mentoring, leadership training, policy education, technical assistance, legal advice, and opportunities for capacity building. They also have access to grants through the Moe Family Fund and the Peter Brink Fund administered by the National Trust. Partners Network members engage with one another through webinars, retreats, mini-conferences, and special programming at PastForward. Members are encouraged to contribute to the Partners Network by participating in network-related convenings; completing an annual survey designed to identify the needs of—and tools available to—the preservation community; championing preservation issues applicable to their organizations; and serving as writers, trainers, speakers, and mentors. Dues are based on each organization’s budget and range between $250 and $1,500. The National Partners Preservation Network aims to continue decades of invaluable connections across our preservation communities. The organization designs and delivers programs, services, and advocacy to strengthen both individual organizations and the preservation movement. In sum, we exist for each other. For more information about the National Preservation Partners Network, visit the Facebook page or contact Daniel Carey, president and CEO of the Historic Savannah Foundation, at dcarey[at]mhsf.org or 912-299-7787. Fairleigh Cook Jackson is a board member of the National Preservation Partners Network. Discuss this blog post and more on Forum’s new online community. Sign up now. The Preservation Leadership Forum of the National Trust for Historic Preservation is a network of preservation leaders — professionals, students, volunteers, activists, experts — who share the latest ideas, information, and advice, and have access to in-depth preservation resources and training. © 2017 National Trust for Historic Preservation. All Rights Reserved.The National Trust for Historic Preservation is a private 501(c)(3) nonprofit organization. The National Trust's federal tax identification number is 53-0210807.